SBI has waived the merchant discount rate (MDR) on the RuPay debit cards with immediate effect for the convenience of customers. BHAWANIPATNA: The demonetisation of high-value currency notes saw a steady rise in the bank deposits across the district. Around Rs 115 crore has been deposited in different branches of SBI in Kalahandi till Tuesday. Deposits in other commercial banks have also increased during this period. Regional Manager of SBI, Bhawanipatna, Niranjan Mohapatra said there has been a heavy rush in the bank in the last few days for cash transactions. 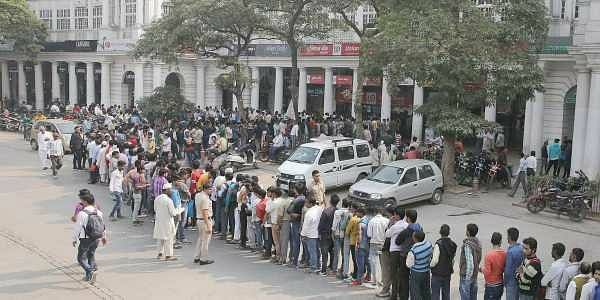 In a bid to get rid of the old notes and get new ones, people have been making long queues in the banks, Mohapatra said. SBI has waived the merchant discount rate (MDR) on the RuPay debit cards with immediate effect for the convenience of customers. This move would be helpful for Kissan Card Holders. “Unfortunately only 20 percent of the Kissan Card holders in the district have obtained RuPay cards due to lack of awareness,” Mohapatra added. For easy access to cash, all the 71 ATM machines of SBI in the district have been calibrated to dispense new currency notes. Further, to help customers in rural pockets, six mobile SBI ATMs with swapping machines have been put into service. All business correspondents of SBI have been provided with `50,000 each for the exchange of notes. Besides, ‘Point of Sale’ facilities have been provided in important petrol points.